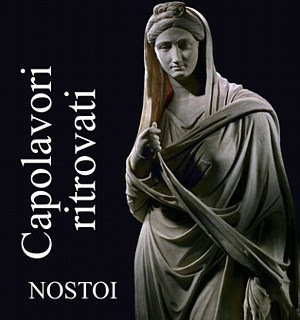 Among the antiquities displayed in the Rome exhibition, "Nostoi: Capolavori ritrovati", are objects formerly residing in well-known North American museums and significant private collections. According to court documents, the Getty bought the griffins from the New York diamond magnate Maurice Tempelsman in 1985 in a deal totaling $6,486,004. The sale was handled through the London dealer Robin Symes, the documents indicate. Hecht reported the find-spot for the two polychome pieces was from Orta Nova. Giacomo Medici is quoted as saying that the Apollo came from a nearby villa. 56. Two griffins attacking a fallen doe. Marble, polychrome. Ex Getty 85.AA.106. Bibl. Gill and Chippindale 2007, Appendix A, no. 3. 57. Lekanis. Marble, polychrome. Ex Getty 85.AA.107. Bibl. Gill and Chippindale 2007, Appendix A, no. 2. 66. Marble statue of Apollo. Ex Getty 85.AA.108. Bibl. Gill and Chippindale 2007, Appendix A, no. 1. Gill, D. W. J., and C. Chippindale. 2007. "From Malibu to Rome: further developments on the return of antiquities." International Journal of Cultural Property 14: 205-40.